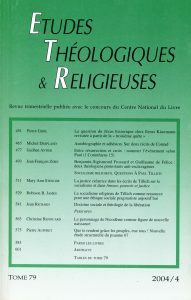 Robison B. James propose une éthique sociale pragmatiste librement inspirée du socialisme religieux de Tillich. L’étude qu’il présente ici montre que l’existence bourgeoise n’implique pas seulement la poursuite dogmatique et impitoyable du profit, comme Tillich tendait à le penser sous l’influence du marxisme. Elle implique aussi un autre aspect de la doctrine d’Adam Smith : les sentiments moraux qui, dans une population donnée, sont la condition d’existence d’un système économique efficace et compétitif. Révisée sur ce point, l’éthique sociale de Tillich trouve aujourd’hui une pertinence renouvelée. Les réflexions de Tillich sur les notions de « bipolarité » et de « justice » contiennent par ailleurs l’amorce d’une contribution décisive aux discussions sur la théorie éthique de l’utilitarisme. In order to work out a pragmatist social ethic specifically, a religiously driven rule-utilitarianism or rule-agapism Robison B. James makes use of Tillich’s religious socialism in two contrasting ways. His paper argues that bourgeois existence not only includes the dogmatic and ruthless pursuit of profits, as the Marxist Tillich thought. It also includes « the other side of Adam Smith », namely, a population with the moral sentiments that make it possible for an efficient, competitive economic system to exist. A Tillichian view that is revised on this point is quite relevant today : it can see how some of the social transformations Tillich thought would not take place without a revolution have been taking place in bourgeois societies in a slow and gradual « kairos ». (2) Certain ideas of Tillich’s help to resolve two long-standing conundrums in utilitarian ethical theory. (a) Tillich’s idea that opposite « polar » qualities are intrinsic to everything – e.g., both freedom and destiny – can make clear the difference between moral and nonmoral values, i.e., between the conduct and social arrangements that are obligatory, and the experiences and conditions that we wish to maximize and enjoy in human life. And (b) whereas utilitarianism appears to say we ought to be unjust to some limited group if that would maximize overall good, religious utilitarianism has grounds for avoiding this result if it understands God as immanent in a Tillichian way. Robison B. JAMES est professeur émérite de l'Université de Richmond, Virginie.